Finding your Pug foods that they will like is very easy. They seem to like just about anything! 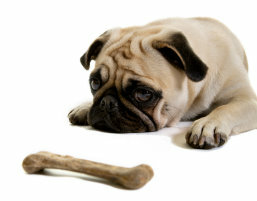 But the fact that a Pug will eat just about anything and seem to want to eat constantly is a problem for many owners. One of the biggest problems with the health of your Pug is obesity. It can lead to some very serious problems if you are not careful to keep your dog’s weight under 22 pounds. There is a fine line between keeping your Pug healthy and keeping his appetite satisfied. Here we’ll offer some suggestions on what we have found to work. As we’ve said throughout this website, we strongly suggest that you consult with your veterinarian. Hopefully, you have found a vet with some experience with Pugs. You can also talk to the breeder where you got you Pug because they are also a very good source of advice. There is a wide range of Pug foods available. Given their choice, most Pugs will prefer a canned or semi-moist food over the dry variety. The key, of course, is to find the most nutritious dog food and you can learn a lot by reading the label. We also think that there is something to be said for having a variety of Pug foods in your dog’s diet. Humans don’t like to eat the same thing all of the time and neither do Pugs. This can also be a health benefit because it can also aid in keeping the digestive tract strong. Your Pug will eat just about anything it will find so if he hasn’t had meat as a part of his diet in a long time and you give a piece of chicken or beef as a treat, he could have some difficulty with it. There are many sources of learning about dog food nutrition and many owners have decided to embark on different varieties of Pug foods after doing a little bit of research. One question that almost every Pug owner ends up addressing at one time or another is: how do we keep our Pug happy without him gaining a hundred pounds? People are always surprised at how much this breed loves to eat. One secret that we’ve found is a vegetable that seems to be a favorite of many Pugs. For our little guy, you can list baby carrots as one of his favorite Pug foods. We give him a carrot as a reward instead of the treats that can sometimes add too many calories to his daily intake. Of course, everything needs to be done in moderation, but we have found the carrots to be a perfect supplement and our Pug absolutely loves them. We have yet to find a vet who says that carrots aren’t a good thing. We have yet to find a Pug who doesn’t like a carrot either, although we are sure there are some. Pugs can be picky eaters. But if you’re able to find a crunchy vegetable that your Pug seems to like, add it to the list of Pug foods that you give him on a regular basis. Our Pug like cauliflower as well but not as much as carrots. Please make sure you consult with your veterinarian but don’t be afraid to experiment with crunchy vegetables. Avoid onions and make sure you read our list of foods that you should never give your Pug. When you own a Pug you come to realize that keeping him happy in the food department can be one of life’s biggest challenges. Pugs are an eating machine!